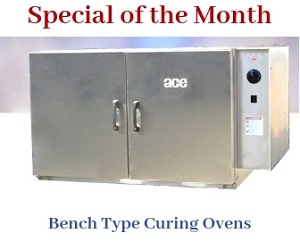 The ACE Model 363 RT burn off oven is designed to remove surface finishes or powder coats. The oven is ideal for parts such as painted hooks and hangers, which no longer possess a reliable electrostatic coating. The oven consists of primary burners and afterburners. These help the radiant tube ovens to heat the part to a specific temperature with direct flame impingement. The paint or powder coat is broken down into heat and gases. The afterburners burns the smoke at 1400°F to produce carbon dioxide. Model 363’s design and components adhere to UL and ISO standards. We can also design the oven adhering to FM and NFPA specifications. For more details, please peruse the tables provided below. Volume Over Cart 58 CU. FT.
1 Top Mounted Pressure Relief Hatch 5.75 SQ. FT.
At ACE, we design the oven with primary and secondary water nozzles, and an automatic shutoff system. If the oven exceeds the desired temperature, the water nozzles can help cool the oven before being shut down by the shut off system.